We had a fantastic range of photos entered for our photographic exhibition and competition, possibly our biggest set so far, and they’re all on display in our front gallery. Come and admire them, and vote for your favourites to join the volunteer choices in our 2020 calendar, available from the museum shop from later summer onwards. The last few of our 2019 calendars are still available at a reduced rate while stocks last. Next year’s theme will be on architecture in and around Herne Bay (the Hampton/Reculver/Herne triangle). Why not take a wander around the town and see what gems you can spot? Setting up the exhibition gallery with all the photo entries. Changeover week for the museum means that while the regular galleries are open as usual, the exhibition gallery is closed while the volunteers prepare for the next exhibition. This time round, it means we’ll be busy framing and hanging the photo entries for the Natural Herne Bay photographic exhibition and competition. From Saturday, you’ll be invited in to look round the collection of stunning photographs and vote for your favourites. We’ll be putting the top 12 in a calendar for next year. Author Lin WhitePosted on January 29, 2019 January 29, 2019 Categories Behind the scenes, ExhibitionsLeave a comment on It’s changeover week! Are you looking for a new interest? 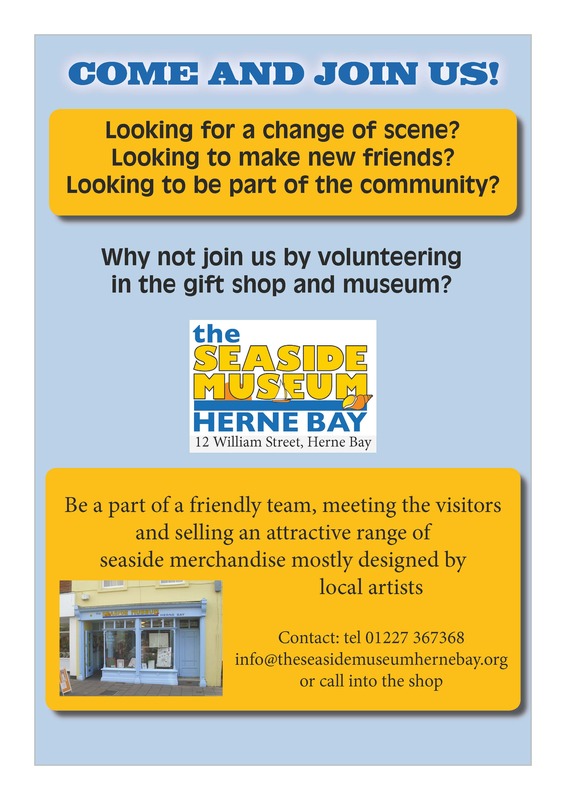 The Seaside Museum is a great starting point for visitors, and our current Dambusters Raid exhibition is proving very popular, but our volunteers are thinly stretched and we’re always looking for more people to join our team. It’s a great opportunity to gain experience in a working environment, meet new people and learn more about our town. Please come and join us, and help us to keep this valuable resource open! As well as taking a shift in the shop (around 3 hours a week commitment), we have people working on the marketing team, building maintenance, organising/coordinating exhibitions, organising stock and the hundred and one other jobs that go alongside running a museum. It’s all change at the museum again this week as the photography exhibition is taken down and the Dambusters exhibition is set up. The volunteers work hard behind the scenes to keep the museum running smoothly. Why not join the team?